IPL6 News File – by Simon Taufel | The International Cricket Hall of Fame. Well it’s been another busy week here at the IPL – it’s involved a match on field umpiring with Nandan (his debut IPL match) in Mohali, some 3rd umpire training with the help of an IPL broadcasting crew, and a couple games as a TV commentator. Yes, you heard right, a commentator. It’s not something I was looking to do, however, one of the things that IPL is becoming known for is its innovation and “left field” thinking – so I decided to give it a go. The first game was with the team of Harsha Bhogle, Sanjay Manjrekar, Simon Doull and Darren Ganga. The lads looked after me very well as they took the lead role and nursed me through it. Below is “pulse question” that was asked of the viewers…out of about 40000 respondents, this was the outcome. I’d like to thank my family for voting so many times!? Thanks for the moment Richie! After this, we moved back to Mohali. Ranjan Madugalle, Marais Erasmus, K Srinath, Vineet Kulkarni and Nitin Menon were the match official team for the game between Kings XI and Pune Warriors. The room in Mohali is “decorated” with a few previous umpires….Venkat, Koertzen, Doctrove, Harper (picture is now missing!?) and me. 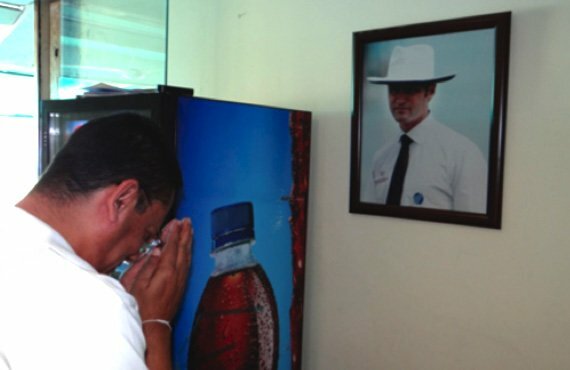 Given my new role with the ICC and the perceived impact some people think I have with selections / promotions, a few of the team decided it was appropriate when entering the room to show some “respect” for said former international umpire. The only thing is, I don’t know whether Ranjan was showing respect to me or Pepsi who are the major sponsors of the IPL this year!? Any thoughts? Anyway, I was able to get some revenge on the ICC Chief “Rafree” with my second match as a commentator. The young man was about to celebrate a birthday, so we managed to get a camera on him and wish him a happy 54th birthday. Apart from this statistic, he was acknowledged for his 141 Tests, 270 ODIs and 56 T20s as an ICC Referee – well done Ranjan and all the best for today! Sorry the photos of the birthday cake did not turn out well enough for this publication. Off to Chennai next for some commentating and then more matches to umpire in the middle. Best wishes for now. Simon.